Is it snowing in La Thuile ?Thank you! (1) At least one overnight stop, (2) requires a whole day, (3) requires more than half a day &ndash; you may have time for a few turns (4) arrive by lunchtime and ski all afternoon, (5) there is a main airport within an hour of La Thuile. (1) There are no buses or taxis to La Thuile, (3) there are slow or infrequent buses / trains available, (5) getting to the resort is easy with frequent bus / train connections. (1) No places to stay in/near La Thuile, (3) a few places to stay in the resort, (5) a wide variety of accommodation suitable to suit all budgets. (1) No luxury accommodation available, (3) just one or two luxury hotels so book ahead, (5) several up-market hotels in La Thuile. (1) There are no child care facilities at La Thuile, (5) the resort has excellent child-care facilities including at least one reasonably priced creche. (1) Occasionally gets enough snow for skiing, (2) is often closed due to a lack of snow, (3) occasionally suffers from a lack of snow, (4) rarely suffers from a lack of snow, (5) La Thuile is snowsure even in the poorest seasons. (1) La Thuile relies entirely on natural snow, (3) there are just a few snow cannons, (5) there are snowmaking facilities on all pistes. (1) There are no snow groomers at La Thuile, (3) occasionally some pistes are left ungroomed and in a poor state, (5) all the runs at La Thuile are groomed daily. (1) there is nowhere to ski when it is windy or visibility is bad and lifts often shut, (3) there are some trees for poor visibility but main lifts sometimes close, (5) La Thuile is mostly in forest where you can ski in flat-light and windy days, lifts rarely close. (1) If snow conditions are poor at La Thuile, it will be poor everywhere nearby, (3) there are good alternatives within an hours drive, (5) other locations on the same lift pass provide a rich variety of snowsure ski conditions. (1) La Thuile usually has poor snow conditions compared to other resorts in region, (3) has average conditions for the region, (5) usually has the best snow conditions in the region. (1) The staff at La Thuile are rude or unhelpful, (5) lift staff at La Thuile are pleasant, cheerful and eager to help. (1) The ski runs are featureless and unvaried, (3) the ski runs are varied but not extensive enough for a week, (5) La Thuile has diverse and interesting pistes including forests and high alpine terrain. (1) No intermediate terrain at La Thuile, (3) intermediate skiers will get bored after a few days, (5) vast areas of cruising runs. (1) Not even a kicker at La Thuile, (3) average sized park quite well looked after, (5) huge park area and expertly crafted pipes, jumps and boardercross trails. (1) There is nowhere to go for cross-country skiing around La Thuile, (3) there are some cross country trails available, (5) the area features many spectacular and well maintained cross-country trails. (1) No designated luge or toboggan runs, (3) there are toboggan runs that open quite often, (5) La Thuile has long and well maintained luge / toboggan facilities suitable for all ages. (1) Overall, La Thuile is one of the most expensive ski resorts in the country and not worth the money, (3) overall represents average value for money, (5) overall offers the best value resort in the country. (1) Overall, La Thuile is one of the most expensive ski resorts in the world, (3) overall it offers pretty average value for money compared to resorts from other countries, (5) internationally the resort offers excellent value for money. Returned from La Thuile last Sunday; our second stay in the last 5 years. 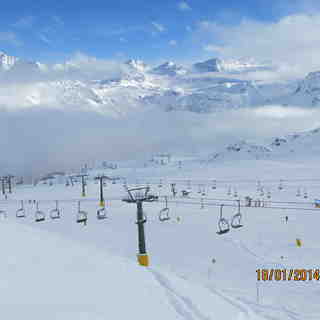 We enjoyed wall-to-wall sunshine, which meant the lower pistes back to the resort were suffering by the end of the day. However, excellent piste maintenance each night meant all of the runs were good in the morning. The snow was excellent, especially higher up; better than on the La Rosiere side. The resort is excellent value for money, with a large coffee, with hot milk on the side, at a slope side bar/restaurant for as little as 1 Euro, compared to 4.5 Euros for the one coffee we had on the La Rosiere side. Everything was cheaper, so we spent far less than we would have done if staying in France, which is what we usually do. We stayed in the Planibel apartments, in the Monte Rossa block, directly above the ski hire shop and locker rooms opposite the slopes. The apartment was a very good size, with 3 separate bedrooms, 2 bathrooms/toilets and a large living/dining area as well as two sunny balconies. The only down side is a small and very dated kitchen, which limits what you can cook, but which we knew to expect. They could easily increase the size of the kitchens and improve the cooking facilities and put in a dishwasher (which would save them power and water over time). The staff in reception were very friendly and we got into our apartment just after 12pm. Although, some other people had to wait a short time The local shops are well stocked, even though they are limited. We will definitely return! Finding the best snow and the best skiing for your next holiday. There is no doubt climate change is effecting ski resorts and every skier hunts for a high altitude ski resort hoping that it will guarantee skiing. High altitude resorts generally come with a price but altitude is not the only factor that one should consider when choosing a reliable ski resort so check out these pointers first and you will be pleasantly surprised as to how many little known resorts can be just as reliable and won't leave you mortgaging your home to pay for your ski holiday •Having north facing slopes are just as critical for a ski resort. In the snowy, pre talked about global warming days, many resorts in the northern hemisphere were built facing south into the sun as that meant you could stay alive while skiing and not end up with frost bite. Nowadays, cold north facing slopes are where the snow stays best. •Probably the most important factor is geographical position in relation to the topography of the mountains. Resorts that are built only on one side of a high main mountain chain may only get snow if it comes from a certain direction: north, south east etc. A resort that extends to both sides of the main mountain range means that it will always get snow from whatever direction it comes from. Resorts built on both sides of a mountain range also means that the surrounding mountain range is not too high to restrict the weather from passing over to both sides of the resort. •Nearby surrounding glaciers also play an important part not only because they keep the temperatures colder but also because they wick away the moisture in the atmosphere. Humidity in the atmosphere melts snow very quickly when the temperatures warm up. Low humidity also keeps the snow in better condition as it gets less icy and lasts longer. An open valley, rather than a valley that is closed in with high surrounding mountains, also has a drier atmosphere. •Wind plays an important role as well. Windy resorts tend to have a drier and colder climate as well and wind tends to shift the snow into bowls creating unbelievable depths of snow sometimes. Look for resorts with wide open bowls especially on the leeward side of the predominant wind direction which is usually west to east in the European Alps and strangely enough on most mountain ranges. •The other fallacy that skiers tend to believe is that it snows more the higher up the mountain you go. Unless temperatures are well above zero in the village it actually snows less per square meter on a steeper slope than a more gentle slope and the volume of snow is less the colder the temperatures are when snow is falling. It snows less on a steeper slope because the same square meter of snow falling out of the sky covers a larger area on the ground the steeper the slope gets, so more gentle slopes have far more snow coverage than steep slopes. This all means that you can find resorts that are reliable for snow but that are not generally high in altitude and of course with high prices to match. It takes a bit of research to suss them out but it’s well worth it as not only do you save money but you’ll find these resorts are generally less known and usually totally 'crowd free'. You could, of course, save the hassle and just come to La Thuile in the north western Italian Alps where Eddy Nico, who owns the Chalet Alpina, has already done all the research for you as it fits all the aspects mentioned above. •Situated on a major alpine divide between France, Italy and Switzerland it manages to get snow coming from all directions. •Surrounded by some large glaciers it has a dry, cold climate and the pistes are mainly north facing. •Snow reports over the past 10 years have shown that it has far better snow right down to 1500 meters than most other resorts in the Alps. It’s ski runs are usually open from the end of November until the end of April right down to the town which is at 1500 meters. •Prices are half the price of other resorts. •It’s crowd free as the lift capacity serves 50,000 skiers per hour and it’s bed capacity is only 3000. •It’s in Italy so the food’s good and the people are friendly. There is no doubt about it Italy offers the best value for quality skiing in the Alps. Hotels are great, food is the best and Italians are the most caring people on earth. There is no doubt about it though the French pistes (not the off-piste) are more challenging. La Thuile, fortunately, is one of those hidden gems that offers you the value and quality of Italy plus the challenge of French skiing. Why should a border line make such a difference you ask when mountains are mountains ? 3 million years ago who cared or even noticed whether you were skiing in France, Switzerland or Italy? There are, however, some reasons for this. Italian resorts fear injury claims. If you've ever been involved in an Italian court case you'll understand why. They take forever to resolve. Italians also want to enjoy their skiing as part of an all round experience; the fresh air, the good food and the sunshine. Piste making in Italy is geared towards this. Wide open perfectly groomed runs with the first runs of the morning facing the sun and the last ones following the setting sun. That's not to say all ski runs in Italy are easy and some of the black runs in La Thuile will even give the good skier a run for their money but when you are looking for some big mogul runs and some snowboard fun parks all you have to do is pop over the border on your skis and you're in France skiing "a la liberte " in the resort of La Rosiere. La Rosiere linked to the resort of La Thuile in a ski area with 150km of pistes offers you that opportunity to experience French freedom and French patisseries. It's worth skiing over to La Rosiere. It only takes half an hour to ski to the La Rosiere lift system from the main gondola station in La Thuile and the views down to Val d'Isere with Bourg St. Maurice in the valley are majestic. Don't delay though while delighting in that little French tart smothered in cream or you'll miss the last ski lift back and have to spend the night wining and dining in the cute little village of La Rosiere.......so !! We have been coming to La Thuile for years and we often take for granted how fantastic it is; great snow (even in Dec 2015) which is well pisted, a good range of runs that suit all abilities, efficient lifts and a range of restaurants from mountain huts to fast food places. Our only complaint is the lack of a bubble lift up to Chaz Dura so on windy days this can be off putting. The blacks to the village are fantastic when open, the famous no 3 has been used for the womans downhill in 2016. It is common to see top ski teams train here and in January the world Telemark ski championship is taking place. The village has a range of restaurants and bars although if you are young the apres-ski might be a bit limited. The locals go to a bar called Angela's bar but there is also a very nice cocktail bar in both the 4* and 5* hotel. Accommodation: something for all pockets so do your research. We stay in nearby Les Thovex which is a 5 minute drive or 20 minute walk or a 10 minute trip on the ski bus. Took my son for his first ski trip to Europe and could not have been more pleased with the skiing conditions at Le Thuile. The slopes were covered with several feet of snow and all the trails were open, empty and made for a great day of skiing. I think I counted that we went on over 20 lifts. There were plenty of opportunities to ski off-piste which we enjoyed, although it was a lot of work with the deep powder. The ride to La Rosiere was fun and challenging, with varied terrain but always plenty of snow. There were several times we stopped at the slope side restaurants, facilities or just to enjoy the views of the Italian and French Alps. By the way, red slope markers mean that you're going on a black diamond slope in the US and could be quite challenging. Lots of high-speed chairs and hardly a wait to get on the lifts. A five day ski pass for my son was €100 ($111) and for me $180 (or about $199). I'm surprised I found this place, because I had never really heard of it, but I would highly recommend it to all of my skiing family and friends. I can't wait to go back. Incidentally, the five day pass allowed us to ski one day at another resort, and we took our rental car to the Matterhorn (Zermatt)! Also epic. Just returned from a fantastic long weekend in La Thuile. As ever, there were no lift queues and the pistes were in great order. We stayed at Hotel Le Miramonti which was fabulous, a 10 minute stroll to the resort centre/ski lifts or you could take the courtesy minibus provided by the hotel. All in all, if you are looking for a modest transfer, only 1 1/2 hours to Geneva and a quiet resort with no queues but with enough skiing to keep the intermediate skier occupied for 3 or 4 days, then La Thuile is a must. Don't forget to make the short trip across to La Rosiere; well worth it with their south facing runs. Just returned from La Thuile and found it to be one of the best resorts that we have visited in almost 30 years of skiing. We will definitely be returning at some point in the future. We stayed in the Planibel apartments, overlooking the lifts and pistes. The staff, in reception, where very friendly, unlike some of those that we have encountered in some French resorts. The apartment was more than adequate, with the two electric hobs and microwave/grill; fine if you plan ahead. It was cleaned and fresh towels provided after two days. Everything you need is close at hand and the prices are generally good for a ski resort. You can always walk down into the old town, which has its own charm. The skiing and lifts were very good, certainly better than the La Rosiere side where we have stayed previously, although it was nice to be able to ski over on the one day that the links were open, if very cold. The resort does seem prone to the wind whistling through the pass, but there are more sheltered areas and the lower slopes, through the trees, were great when it was overcast, foggy or snowing heavily. The runs down into the resort would be very challenging for beginners, but there is the gondola available for return journeys, if necessary. There were no real queues for the lifts, although a fall of snow seemed to take the operators of the lowest chairlift by surprise one morning, so it was late opening. The pistes were well maintained and moguls barely began to form, even those on the black runs being smoothed out each night. They were almost always quiet, some being deserted, apart from us, on many an occasion. There are some great runs from the highest lifts all the way down to La Thuile, up to 12km. There are also plenty of places to eat and drink on the slopes and we particularly liked La Clotze, just below the start of the Chalet chairlift. Overall, a big thumbs up for this quiet, value for money and friendly resort. I’ve been in La Thuile many times. Wonderful runs for all abilities, good weather, no queue for lifts. In 2012 I stayed in Hotel Maison de Neige. 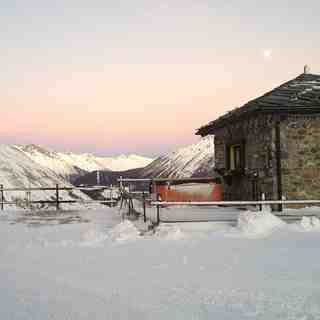 Wonderful place overlooking La Thuile ski runs n. 7 and 4. Guests can reach the hotel by snow trucks or snowmobiles supplied by the hotel and they have the luxury of waking up, having breakfast and going skiing when everybody else is still asleep. Good indoor and outdoor wellness area. I've been to La Thuile more times than I can remember now and not got a bad word to say about the place in relation to my personal interests. When I was younger me and my younger brother would go with our parents. Now we are both older (21 & 26 years old) we still return usually on a yearly basis and even took a friend with limited skiing ability last time. Me and my brother have been skiing many, many many times before and there's still runs that test us so if you're intermediate to expert there's plenty to test your skills with here. At the other end of the scale we took my friend with us on our last trip whose only experience was 1 week skiing with the army and he equally fell in love with the place. Runs for everyone to enjoy. We tend to stick more to the La Thuile side because the Long pulley lifts on the La Rosiere side are a drag (pardon the pun) and we've noticed that it's fairly busy over there compared to La Thuile where, as others have mentioned, you NEVER have to queue and quite often you get the mountain virtually to yourself. A hush hush tip in my opinion would be to set off up the mountain early and get as high as possible then head to the fair left side of the mountain (far left as you look up the mountain). Over that side we usually enjoy the long variety of red runs for a good 2-3 hours before we even see any other skiers and the snow is of perfect standard on and off the piste. You can work your way back across the mountain as the day continues. Only one or 2 bits of annoying flat that some complain about (red run 6 and the very long and boring red 7, I believe but that's from memory) red 6 is actually quite a good run that takes you from the gondola down to the bottom of the mountain, just keep your speed up when you access this run by going left immediately when you leave the exit to the gondola. It's not really a problem if you get even minimal speed up just a tight left hand turn that catches snowboarders out as it's flat for second. Red Run 7 is the only run I'd advise not to take depending on your interests. Very Long and once you're on it you're virtually stuck on it until near the end of it. Flat spots and such. Mostly used for the slower paced or people just wanting a mellow journey to the bottom looking at the scenery. (These people like my father will then complain at the bottom at how exhausting and long it was because there isn't much hill to it.) I'm strictly a skier so my opinions are based purely on those who love to ski but I've visited with people who have snowboard before and as long as you pick your routes carefully as a boarder you will love it. My brother snow blades the entire week and even though some reviews say there isn't much in the way of jumps recently they've made a new terrain park and we've always found plenty of jumps and runs that test skiers and snow bladers alike. Got lots of great jumps (and falls) on camera in La Thuile so don't think for a second that there aren't jumps and such. As others have reported there is no or limited nightlife. I personally go skiing for the skiing not to get smashed. Hot summer holidays is what I'd pay for if I wanted that. There is, however, more than what most reviews give credit for in La Thuile. We usually catch a good dinner at one of the many friendly places to eat scattered around the village then return to the apartments area where there is decent bars/pubs to set up shop in for the evening. The apartments are basic but for the price and location you cannot grumble. I love a hotel you can literally ski right up to and in La Thuile you can do just that. Get speed up and turn left at bottom of the slope outside the apartments and you can glide all the way to your door. Be careful of any people that may be about on the final slope though as these are learner slopes. Turin airport is only a short bus ride away from La Thuile which is pleasing as there's nothing worse when you're tired after your flight than an uncomfy bus journey for hours. Great views so make sure you take a camera up the mountain with you. You'll want to capture the views from various points on the mountain. Advice would be to make use of the mini market in the apartments complex. There prices are similar to UK supermarkets and taking small nibbles and water up the mountain with you will cut costs massively. The snow and weather is so good it's hard to complain about any of the conditions in La Thuile. The last two times I've been we've suffered a day of total white out. Which while this creates incredibly cold temps supplies lots of natural snow and for the brave among you, gives you a great challenge navigating your way down the mountain when you can barely see 2 yards in front of you. Phone signals are usually good but we always have a walkie talkie on each of us as they are a life saver if you get split up from those with you. The resort is highly underrated and that's just how I like it! Never any queues, quality snow, amazing variety of slopes for all levels.